Effective prayer is the solution to Moving Mountains in John Eldridge's book on changing the world one prayer at a time. Ever wondered what prayer can do? How would it feel to enter into prayer with confidence and assurance--certain that God heard you and that your prayers would make a difference? It would likely feel amazing and unfamiliar. That's because often our prayers seem to be met with silence or don't appear to change anything. Either response can lead to disappointment or even despair in the face of our ongoing battles and unmet longings--especially when we don't know if we're doing something wrong or if some prayers just don't work. In a world filled with danger, adventure, and wonder, we have at our disposal prayers that can transform the events and issues that matter most to us and to God. 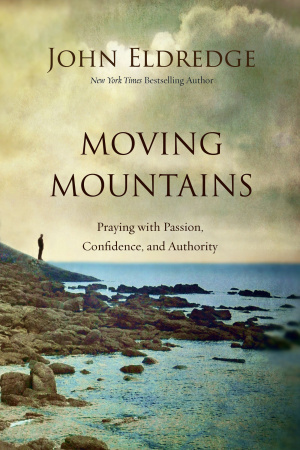 Moving Mountains shows you how to experience the power of daily prayer, learn the major types of prayers--including those of intervention, consecration, warfare, and healing--and to discover the intimacy of the cry of the heart prayer, listening prayer, and praying Scripture. Moving Mountains by John Eldredge was published by Thomas Nelson in March 2016 and is our 13426th best seller. The ISBN for Moving Mountains is 9780718079536. Be the first to review Moving Mountains! Got a question? No problem! Just click here to ask us about Moving Mountains.